Looking for a way to keep your motivation? 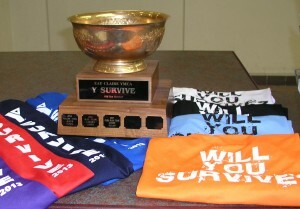 Y Survive is a great way to try new activities, meet new friends, engage in a little friendly competition and most importantly, stay committed to fitness! Workouts are individual however points count towards TRIBE totals. All physical activity you take part in at YMCA will count towards these points! Points are being recorded on our computer FitLinxx system. Branches will run special Y Survive events throughout the challenge. Bonus points are awarded for attending special events, and even more points if you wear your Tribe t-shirt. Meet new friends, stay inspired and motivated, discover better health and gain stronger bodies! Only $10 to participate! Includes cost of t-shirt. It’s time to distress before the holidays! Shawnessy’s own Stacey M will be teaching a drop-in Yoga Nidra, deep meditation class on Thursday December 19th from 7:15-815pm in the studio located upstairs at the Shawnessy branch. Please come early to make sure you get a spot! Sometimes it can be challenging to get your workout in during peak hours on our weight floor. Take note of other people around you in workout areas. Help reduce wait time and maximize resources by sharing exercise equipment, machines and space to ensure everyone has the best possible experience during each visit. If you let someone else use the machine while you have your “rest” period, several people can use the same piece of equipment at the same time. It’s all part of the respectful and caring culture we promote and build at YMCA Calgary. And who knows, while exchanging pleasantries during interactions, you may even meet a new workout buddy! Good question. While the answer varies depending on individual goals and circumstances, these general guidelines can be helpful for your good health. Muscles need at least 48 hours of rest in between sessions to recover. Stretches should be done after your workouts so the muscles are warm, hold each stretch for 15 – 30 seconds. Use these guidelines for a great workout. If you’d like to seek some specific advice, there’s no better time than now to invest in personal training! When a person is lifting weights there is a short period of time in between sets where it is good to take quick breather to rejuvenate your muscles. However, there are many who abuse this time and decide to turn a quick breather (30 seconds – 1 minute) into a time of shameless sloth and lounging. I speak of the people who sit on a bench for 5+ minutes just cruising on their iPod or talking with friends. Working out with friends can definitely be beneficial, especially for spotting and motivation but I want to see people enjoy themselves at the gym, but also be effective weight lifters as well. A great way to burn more calories and get more from your workout is to simply speed up. Don’t speed up your reps as that will result in lower muscle development and a higher chance of injury. Instead, speed up the time in between sets. Give yourself enough time to recover from a set, but then hop right back into the swing of things. If you are working out with a partner, the time that the other person takes to finish one set is more than enough for your recovery time. Stay focused and keep hammering the weights. At the end of your workout, if your muscles are not tender and your shirt looks and smells like you just purchased it fresh from the Febreze factory, you are doing something wrong. If there is not a bead of sweat on you and you don’t even consider a long, hot shower before your next class or meeting, you are doing something wrong. Under Armour runs a beautiful campaign surrounding the phrase “Sweat every day”. This campaign involves striking visual images of men and women pouring their heart into their various workouts. The intensity shown in these commercials is what I always strive for. There is something euphoric about being in the gym, pouring sweat, music blasting and knowing that you have given everything you have. On a physical and mental level, there is a peace that is found. Make the most of your gym experience and truly put in the work. You will get out what you put in – that is a promise. See you on the weight floor. Lesson Three: Hey You! Get Off the Phone! Some days you don’t get enough sleep. Some days the coffee is simply not strong enough. Some days your alarm clock awakes you with a devious smile spread across its digital face. I get it. Everybody gets it because we have all been there. Fueled by adrenaline, you punch the gas of your vehicle or ride the bus with twinkling eyes and a fire in your heart. As you reach the gym, you jog in, scan your id badge and feel like flopping right down on the desk and doing 30 push-ups just to show the staff that this is your time! YOUR TIME! You load up the bench press with 350 pounds even though you only weigh 137, look at it ready to conquer the heft, only to realize you haven’t bench pressed in six and a half years and you are too elite to make poor decisions this morning. No worries! You move to the free weight section and start slingin’ around weights like Yosemite Sam throws around his mustache and cartoon guns on Saturday morning Looney Tunes programming. But as you roll into the 7th minute of your workout, you hear car crashes and sirens and screams of horror in the frontal lobe of your brain. Oh dear. The adrenaline has gone! Between yawns and deep sighs of growing angst, they drag themselves from machine to machine, dreading each moment of the work out. Crying silently in their head, they pull the pin from the weight stack, lift exactly zero and a half pounds and re-evaluate their life decisions. Friends, this is no way to go to the gym. I am big on productivity and engagement and if you know for a fact that you won’t have that level of engagement on certain days, it is alright to have a day off! Remember that! Schedule in time for yourself to go to the gym throughout the week around a realistic schedule. If you have to work super late or have a ton of homework to do late at night on Saturday, maybe a 6 a.m. spin class is not what you need on Sunday. Do not get me wrong though. Don’t put off the gym for weeks because you are busy and tired, because the gym will give you more energy in your week. There is a difference between listening to your body and being just too lazy. Plan your gym time around realistic goals and ensure that when you go to the gym, you enjoy it and get something out of your time there. For the love of humanity, get off your electronic devices people! The gym is a place for self-development and fitness, not for cruising through your iPod for an eternity. What few people realize is that using over-using electronics during a workout abruptly curbs productivity in the gym. At the YMCA, there is a no cell phone policy and I believe this to be a positive endeavor. This policy may limit your tweets and text messages, but it will greatly expand your fitness level. Utilize music players, but use your devices within reason. Find an album you like and stick to it. You are at the gym to workout, not to create your next party playlist. Let me illustrate the negative aspects of over-using electronic devices in the gym with an experience I had a two years ago. Fun fact: when your thumbs are the sorest part of your body after a workout, there is a problem. I urge you to not follow in the footsteps of Texty-Loo and Texty-Sue. Leave your phone at home! It slows your productivity no matter the level of cell usage you have during your workout. I prove this fact with a test that I recently conducted. I hated to be that guy, but I brought my phone to the gym to test a theory I had about cell phones and productivity at the gym. I conducted my test at a gym that allowed cell phones on the weight floor and soon realized that all gyms should have a no cell phone policy like the YMCA. Entering the gym, I turned my phone’s ringer to the max, felt free to answer it when it rang and ensured that I responded to all texts, emails, and calls in a timely manner. In a 90-minute workout, I answered six text messages (as one conversation began via text), two emails, one phone call and checked Facebook twice. Think about your own cell usage – you know this can be a pretty average hour in our technologically consumed world. Each text took me an average of 45 seconds to respond to. One email was quick one but the other was a more complex one from school, so email response time totaled 5 minutes. The phone call racked up another 4 minutes. My Facebook cruise added another 2 minutes. This brings my total time on the phone in one workout to 15 minutes and 30 seconds. In my 90-minutes, I devoted 17.2% of my workout to my phone. Furthermore, by starting text message conversations and dealing with important emails in the gym, I was thinking about my phone and my life, not about the workout at hand. If you are a person that goes to the gym regularly, you always strive to beat your previous personal best. If I told you there was a protein powder, a new machine, or a new workout routine that could make you almost 20% more effective, you would demand I share my secrets. In the business world, if you told a corporation that you knew a way to increase their productivity by 17.2%, they would literally throw suitcases of $100 bills in your direction until you shared the information. Every time you bring an electronic device into the gym, you tie a boat anchor to you ankle. When you are picking a pump-up song before you do the next set, make it quick and don’t search for a WiFi connection. The gym should be a place of refuge, a venue of solace and solitude away from the outside world. Minimal usage of electronic devices will allow you to be substantially more effective in your workout and will positively develop your mental health as well. Fully focusing on your workout gives you a way to unplug for an hour. As human beings that are seemingly jacked into the social media Matrix and we need that chance to unplug. When we attempt to multitask, we simply do multiple things poorly. If your electronic device is playing music, just let the band play and save Facebook for later. I promise you will be more productive and enjoy your workout more. As the weather gets a little bit cooler this fall, a lot of people are returning to the YMCA gyms, studios, and their favorite fitness classes to keep up their wellness routine. As our classes begin to thrive, please take a moment to reacquaint yourself with five Fitness Class Etiquette Tips to make the experience smooth for everyone. 1. Arrive on Time – joining a class late* can be both distracting and unsafe. Please respect your fellow attendees as well as your instructor and arrive to classes a bit early or right on time. This will also allow you a proper warm-up, reducing your chance of injury. *If lateness is unavoidable, please go to the back of the class. 2. Choose Proper Footwear – closed toed shoes (running shoes, cross-trainers etc…) will provide a non-slip grip on the floor and any equipment utilized in your class. Ensure that your footwear is clean of all dirt and debris. If you wouldn’t wear it in your house, please don’t wear it in our workout areas. 3. Make your Workout Your Own – The instructor is there to guide you through YOUR workout; listen to your body and modify as you see fit. If you are going to modify your workout significantly from the instructor’s planned program, please move to the back of the room as to not distract others from the instructor’s guidance. 4. Socializing – should be done either before or after the class. Talking throughout the class can be viewed as disrespect to not only the other participants, but to the instructor as well. If you can talk, you’re not working hard enough! 5. 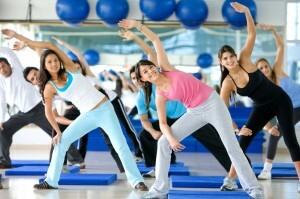 Stay for the Whole Class – Flexibility is a large part of your overall wellness! Be sure to take the time to stretch out the muscles you’re worked. Not only will it reduce soreness in the day(s) after, but it will reduce risk for injury down the road. If you are there primarily to socialize, please respect the people who are there to get in a good workout and keep your conversation to a whisper level (or stay to the back of the room/pool). New to group exercise? Please come a few minutes early and let the instructor know so that she/he can ensure you stay safe during the class. Ditto if you have any mobility issues that require exercise modification. Please come on time – it is unsafe for you to miss the warm up and jump right into the class. Stay right until the end – the stretch is the most important part of any exercise class – your muscles have worked hard and they need the flexibility training and relaxation provided during the final portion of the class. Make sure you bring a water bottle. It is critical that you stay hydrated during class to avoid cramping, headaches, nausea, etc. 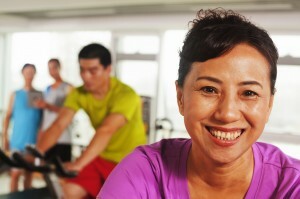 Most of all, have fun – that’s what group exercise is all about!